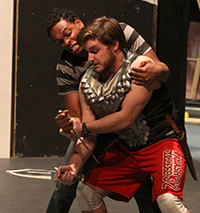 Junior Joe Mount has thrilled audiences in Wabash College Theater productions for his wit, seriousness, versatility, and seemingly effortless talents as an actor. But when he takes the stage in the title role of Shakespeare’s Macbeth, he’ll be pushing himself in an entirely new direction as he takes on one of the most difficult and complicated characters in Shakespeare’s darkest tragedy. 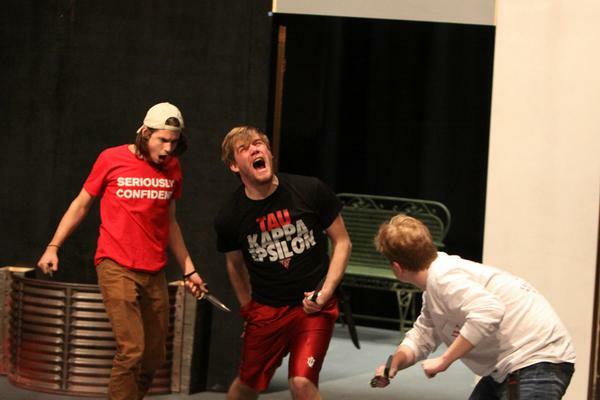 Ambition, power, greed, love, revenge, evil, guilt, and paranoia spill out on the Wabash Theater stage. 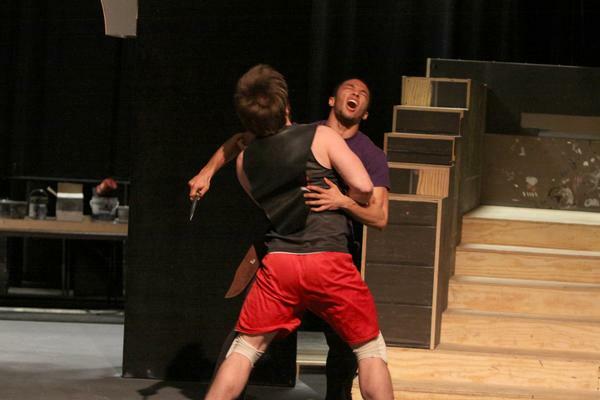 And there is fighting — lots of fighting — murder, and blood spilling, too when Macbeth opens Wednesday, February 26 and continues through March 1. Performances are at 8:00 p.m. each evening and tickets are available through the box office. 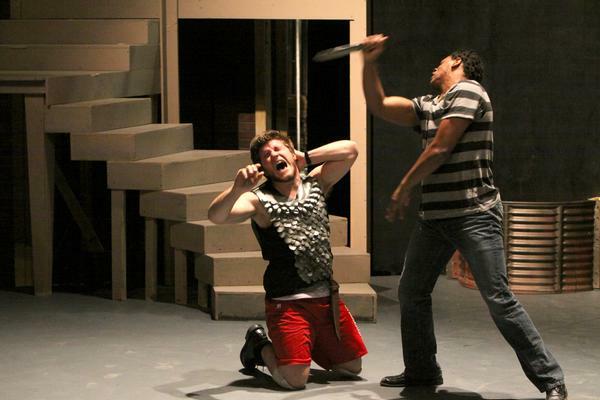 While Macbeth is Shakespeare’s shortest tragic play, it is also one of his finest. Macbeth is a celebrated Scottish general who returns home after war. He is visited by witches, who prophesize that he will become King of Scotland. 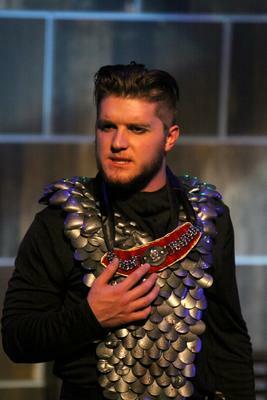 Stoked by his wife, Lady Macbeth (played by Elise Lockwood), ambition overcomes him when he sets out to murder King Duncan (Patrick Stroud) in order to assume the throne and fulfill the prophecy. 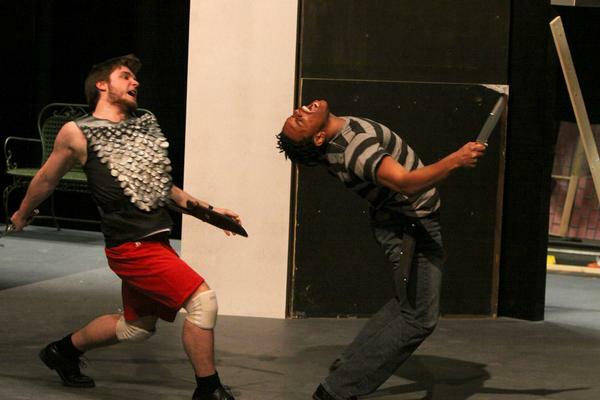 Paranoia consumes Macbeth from there, and he ultimately spirals into madness. Wabash last produced Macbeth in 1957 on the stage of the third floor of the downtown Masonic Temple building. Because of the shape of the semester, Cherry and the production team have been squeezed for time. 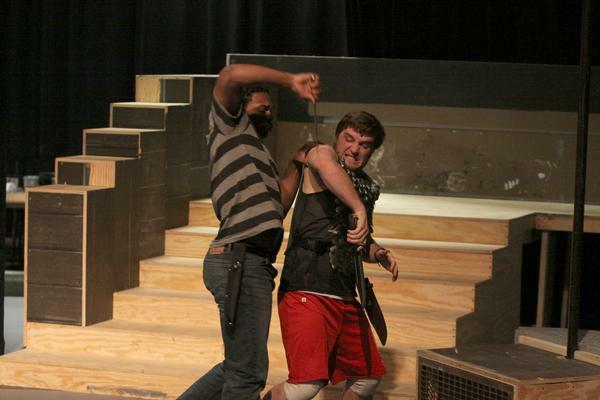 The cast list wasn’t set until late January, allowing roughly five weeks to bring the play to life. 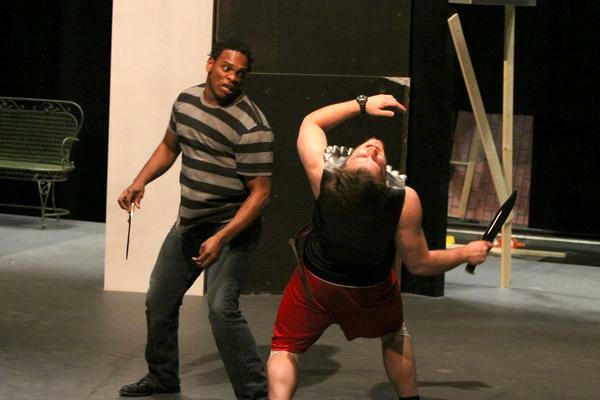 After rough-blocking the play in the first full week of rehearsals, the cast shifted gears to take advantage of the talents of visiting artist Chelsea Pace, a specialist in stage combat, who spent a week at the College. 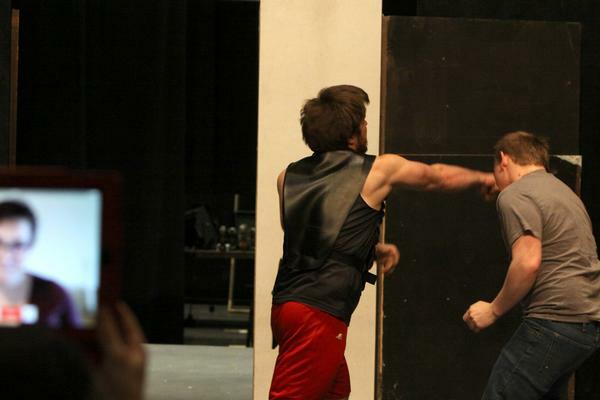 Pace taught the actors how to fight realistically, but also safely. 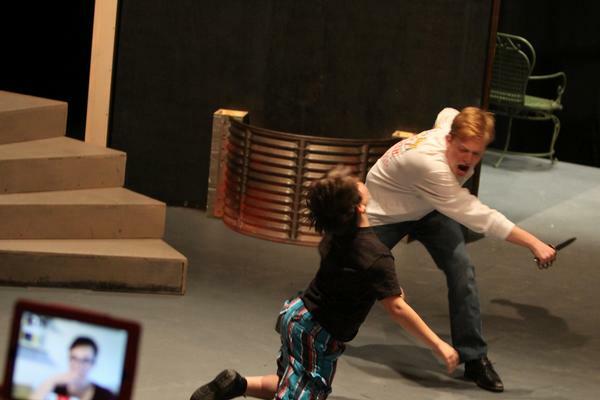 Two of the play’s actors, Tucker Mark (Lennox) and Aaron Stewart-Curat (Young Siward), serve as Fight Captains and together supervise nightly rehearsals that focus specifically on the scenes involving fights and battles. 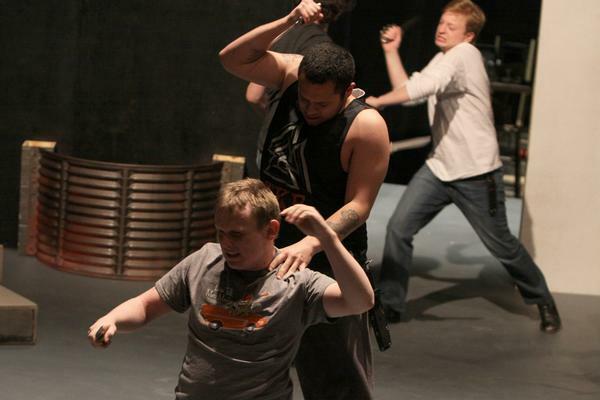 Their goal is to make the fights safe and realistic, but also to ensure that the choreography is fulfilled. 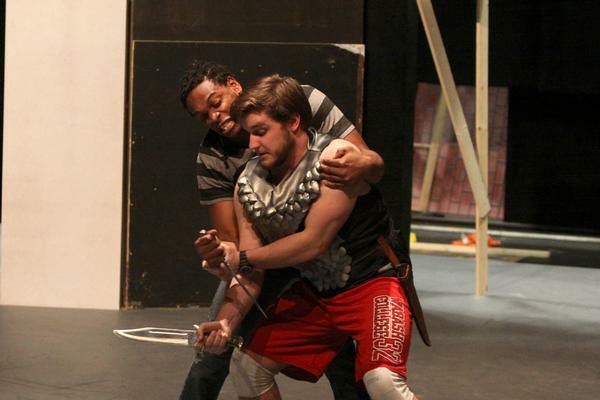 The play features plenty of Wabash Theater veterans, including Mount and Stroud, but also Noah Eppler as Banquo, A.J. 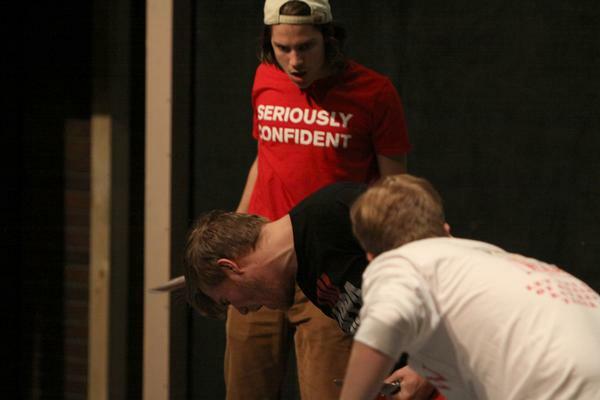 Clark as Macduff, Patrick Kvachkof as Ross, Zach Canon as Seyton, and Rory Willats as Malcolm. 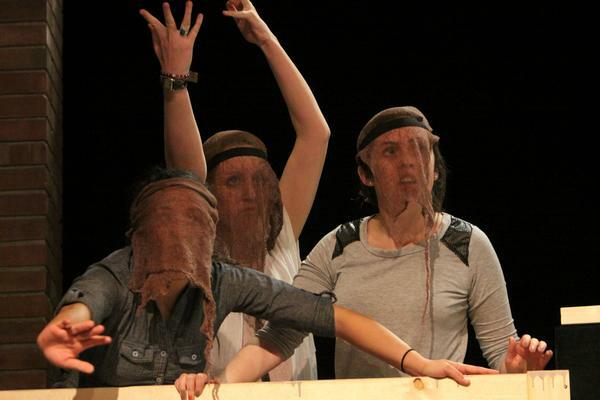 All four of the women in Macbeth are DePauw University students. Lockwood, Felecia Santiago (Lady Macduff & First Witch), and Lanie Gleeson (Nurse & Second Witch) have appeared in multiple Wabash productions, while Grace Lazarz (Third Witch) makes her Ball Theater debut. Costumer Andrea Bear deserves a Tony for her creative and resourceful approach to costume design and construction. Every costume is hand-made, including the armor worn by all the soldiers. Each piece of armor is made from scores of plastic pieces, cut from ordinary water and soda bottles that are knitted together. 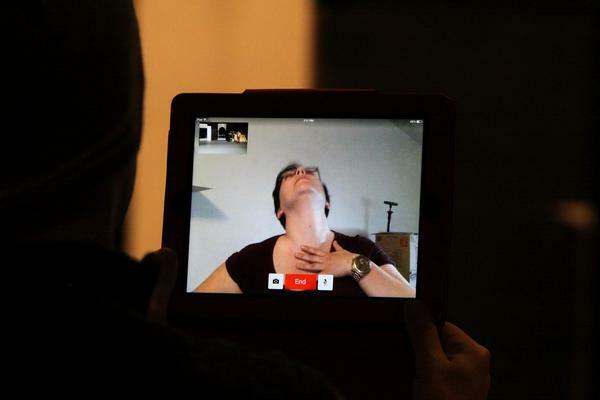 “Andrea’s work on this production is simply extraordinary,” Cherry said. Complementing the costumes and fine acting is the set designed by James Gross, whose challenge was Shakespearean in scope — design one space that includes scenes in castles, woods, battlefields, and even a thunderstorm. 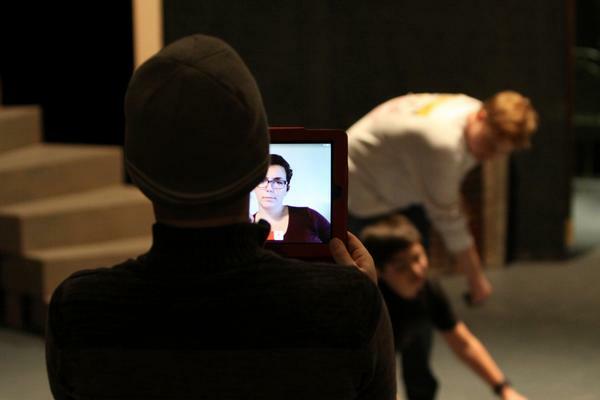 Cherry remarked, “James designed a flexible space that really imbues the production with an atmosphere of foreboding.” Visiting Assistant Professor of Theater Jessie Mills is the sound designer. Cherry also embraces the notion that beneath the gory murders and fight scenes is a love story between Macbeth and his wife. While history recalls Lady Macbeth in pejorative terms — evil, controlling, and manipulative — Cherry sees motivation behind her actions. “We’re looking at the relationship differently. It’s more interesting if you see them as two people who are in love and who want the best for each other, but who make violently bad decisions. So our challenge is to work around the stereotypes of Lady Macbeth and show her for who she really is: someone whose very bad choices are motivated by love.” Mount’s talent and attention to detail and Lockwood’s fearless risk-taking as an actress make the relationship work brilliantly. 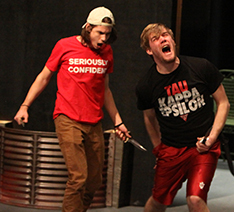 The Tragedy of Macbeth at Ball Theater at Wabash College: Wednesday, February 26 through Saturday, March 1 at 8:00 p.m. each evening. 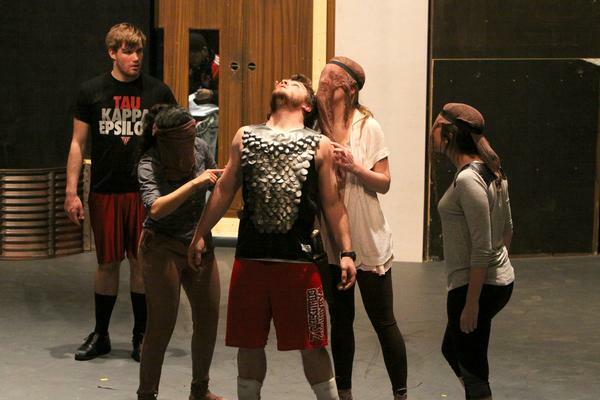 Tickets are free, but should be reserved through the Box Office (boxoffice@wabash.edu or 765-361-6411). 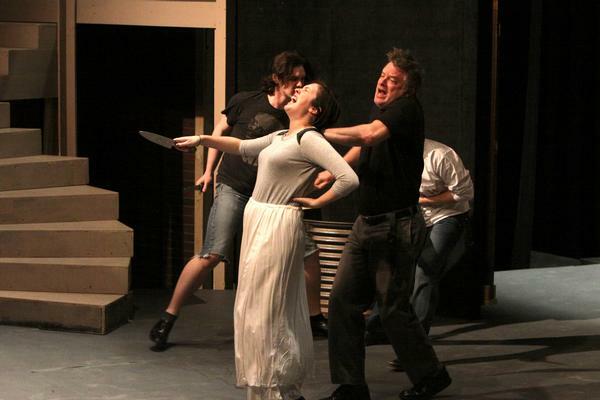 Production Team: James Cherry, Director; James Gross, Scene Designer; Andrea Bear, Costume Designer; Laura Glover, Lighting Designer; Jessie Mills, Sound Designer; and Brad Hopper, Stage Manager. Starring: Joe Mount (Macbeth), Elise Lockwood (Lady Macbeth), Patrick Stroud (Duncan), Rory Willats (Malcolm), Noah Eppler (Banquo), Nik Boggs (Fleance), A.J. Clark (Macduff), Felecia Santiago (Lady Macduff & First Witch), Tucker Mark (Lennox), Patrick Kvachkoff (Ross), Donovan Whitney (Angus), Daniel McCarthy (Porter), Alex Hughes (Son of Macduff), Zachary Canon (Seyton), Stephen Morillo (Siward), Aaron Stewart-Curat (Young Siward), Griffin Levy (Macdonwald & First Murderer), Xinyang Shane Yuan (Second Murderer), Lanie Gleeson (Nurse & Second Witch), and Grace Lazarz (Third Witch).